Ihmisoikeusliitto, a human rights organisation that monitors the human rights situation in Finland, revealed on its Facebook page on 4 September 2014 that one of its workers was followed and verbally attacked in a shop by another customer. According to the Facebook post, the customer followed the human rights workers in a shop and shouted insults as the latter walked away. No one in the shop said anything to the abuser or the abused. Everyone stared as the perpetrator continued the racially motivated abuse -- until a security guard took the perpetrator away. 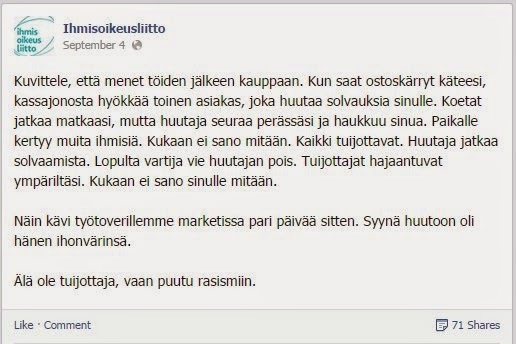 According to Ihmisoikeusliitto, the reason for the taunting was the color of the victim's skin. Keep in mind that the reported racist taunting happened is 2014, not 1960. It's unconscionable that such a thing happens in modern-day Finland, and not a single onlooker lifts a finger. Unlike Ruby, the victim in the shop in Finland was taunted by a single abuser. Although the perpetrator acted alone, the silent onlookers in the shop, I believe, took the side of the perpetrator. My belief that the "spectators" were complicit is hinged on the words of archbishop Desmond Tutu: "If you are neutral in situations of injustice, you have chosen the side of the oppressor". I have argued before in previous blog posts, such as in the piece about the plight of Finland's black taxi drivers, and I'll argue again, that blatant racism persists in modern-day Finland because members of the public and people with the power to change things let it persist. Perpetrators are emboldened by the silence of onlookers. People of good conscience and people in positions of authority in Finland should stand up and speak up forcefully against racism. Until then, racists will continue to drag Finland's international image in the mud by repeatedly perpetrating 1960-style racial abuse in modern-day Finland.